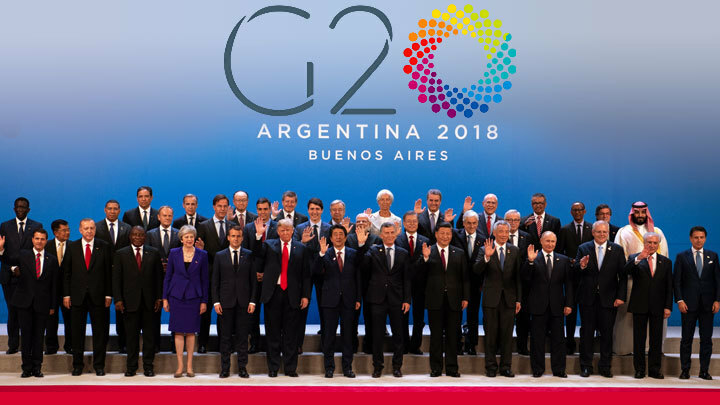 The G-20 summit in Argentina, as experts had expected, did not end with a breakthrough on multilateral topics. The United States opposed “rule-based international order” protectionism as a “threat”. The joint statement, under pressure from Donald Trump, included a clause on the need to reform the WTO, where countries disadvantaged by US tariffs win the courts against the United States. But with the same pressure from Trump the climate consensus did not take place - the United States will continue the course towards a boycott of the Paris Agreement - and on the issue of migration. The White House does not want to risk jobs in the United States in the name of combating global warming and does not believe that “joint efforts” are needed to overcome the effects of migration. If we put aside journalistic “jokes” and “HYIPs” about what Angela Merkel, who was flying not on the service plane, was fed on, the main outcome of the G20 is an agreement between the leaders of China and the USA. After a two-hour conversation, Trump and Xi Jinping agreed that they would not introduce new trade restrictions for 90 days. The United States will not increase the tariffs on Chinese goods in the amount of $ 200 billion from 10 to 25 percent, while China will lower and abolish the 40 percent duty on American cars. China agreed to buy agricultural, energy, industrial and other products of the United States for an as yet not established but rather significant amount in order to reduce the trade imbalance. The Kerch incident forced Trump to cancel the meeting with Vladimir Putin, so the latter had more time left for Recep Erdogan. The Turkish and Russian presidents have taken another step towards resolving the Syrian crisis. They agreed to keep the deal on the “demilitarized zone” in the province of Idlib in force. Putin and Erdogan agreed on further steps to respect the agreement to create a demilitarized strip. But at the same time, measures will be taken so that the militants could not “sabotage” the Sochi declaration. For his part, Erdogan offered Putin to hold another Idlib summit. If with Putin, Erdogan found mutual understanding on the difficult issues of Idlib, the results of Erdogan's meeting with Trump for the press remained unknown. This means that there are no results. The US still has not removed the Kurdish National Self-Defense Detachments (YPG) from Manbij in northern Syria and are not going to do that. Consequently, the tension between Ankara and Washington is extended. Provocation with the participation of Ukrainian boats near the Kerch Strait has fulfilled its main tasks. The G-7 adopted a resolution condemning Russia, considering it to be its “aggressor” and not Ukraine. Trump's meeting with Putin was disrupted. Just in case, once again to dismiss any suspicions about collusion with Moscow from his boss, Pentagon chief James Mattis accused Russia of interfering in the mid-term elections. For the European Union, which, with the political changes in Austria and Italy, began to hesitate in matters of sanctions, there was another justification for their extension. And the President of the European Council, Donald Tusk, before the G20 began, confirmed that the European Union is united in supporting “the sovereignty and territorial integrity of Ukraine,” so the EU “will extend sanctions against Russia” at the December summit. If we return to the economy, it should be noted that not only the fate of the “world trade war”, but also the price of oil depended on the G20. Journalists promised trouble for Muhammad bin Salman for suspicion of his involvement in the murder of journalist Jamal Khashoggi. Ben Salman’s conviction should have hit the price of oil, which recently dropped to a minimum of $ 60 a barrel since October 2017. However, nothing like this was in sight. Yes, French President Emmanuel Macron, Japanese Prime Minister Shinzo Abe, Trump and Erdogan stated the need to “search for the truth” and “involve international experts” in the investigation. However, nobody pointed a finger at bin Salman. The journalists were extremely surprised by the friendly greeting of Vladimir Putin and the Saudi crown prince. It conveyed not only Moscow’s equidistant position on the Khashoggi issue, but also an agreement between Riyadh and Moscow to continue regulating oil prices. Already on December 6, Putin and Ben Salman will send their energy ministers to Vienna, where at the OPEC + Russia and Saudi Arabia summit they are going to cut oil production.